As I’ve shared before, Motor Man and I take his mother (Motor Mum) to lunch nearly every Sunday. Afterward, we take her for a ride or off on a little adventure. Recently I was in our local pharmacy, and the pharmacist, who knows Motor Mum, inquired about her. I shared with her that we were always in search of a new adventure. She asked if we’d been to Wild Birds Unlimited. I was familiar with the shop, but hadn’t been in our local one. The pharmacist told me that they have a little deck off to the side of the shop, where you can sit and bird watch. Motor Man and I were in the area yesterday after dinner, and we decided to give it a “trial run”. The shop is located in a commercial area, but there’s a residential development directly behind it. There are flowers in colors meant to attract birds, especially hummingbirds. Comfy rockers await bird watchers. 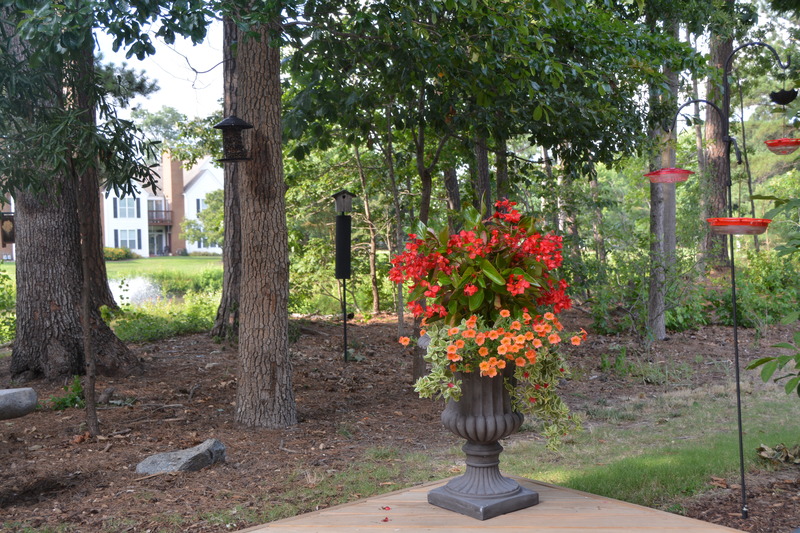 There is so much to see in the shop itself: bird seed, bird baths, bird feeders and yard art. (I did quite a bit of window-shopping.) The employees were very welcoming and urged us to bring Motor Mum in for a visit. Yes, I do believe we have an idea for a future Sunday adventure. 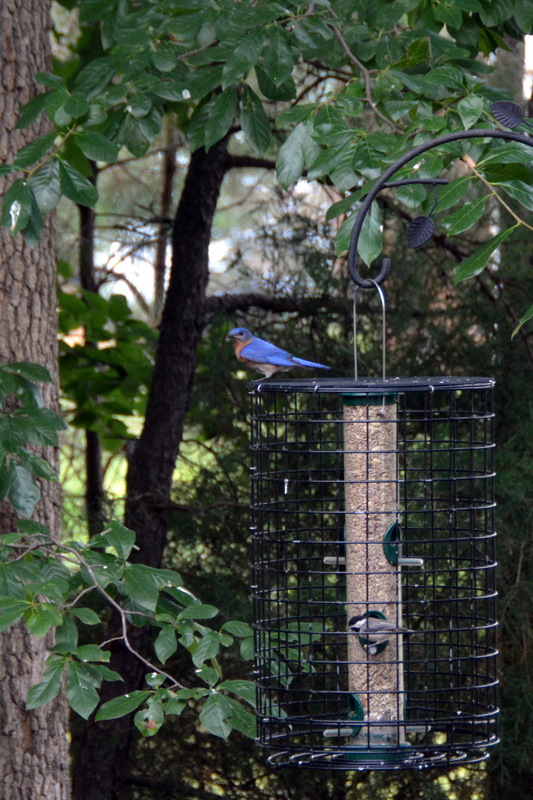 This entry was posted in Family, Traveling Days and tagged blue birds, wild birds unlimited. Bookmark the permalink. 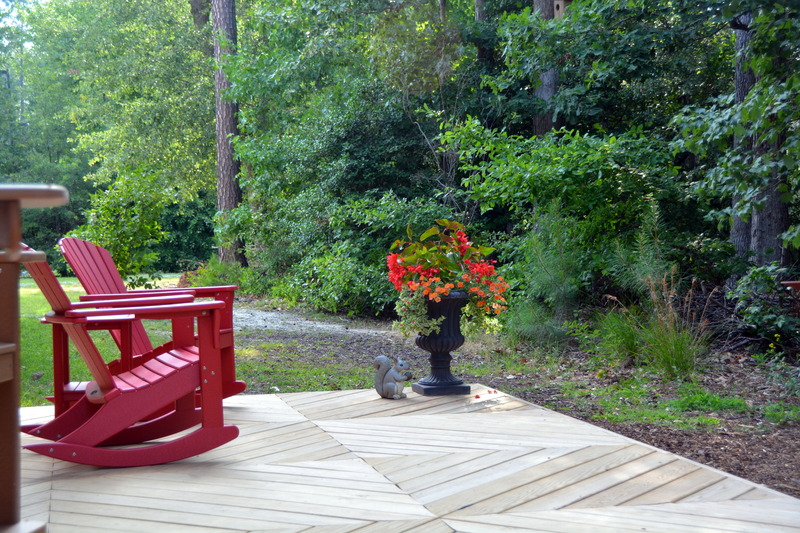 Sounds like a great spot to enjoy Mom Nature and her bird show…..and some peace and quiet! Always nice to find an unexpected adventure. I’m sure Motor Mum will enjoy it. At least, I hope so! What a charming place to spend some time relaxing and bird watching. Sounds like a wonderful business. I’m glad they go the extra mile to help folks enjoy the birds. That is the perfect place, isn’t it? I would love sitting in one of those red rockers for a spell to watch and listen. Fun adventure! I like to support my local Wild Birds Unlimited. Such knowledgeable and helpful staff. Nice bluebird shot! That looks like a fun place. I may have to check it out! I love Wild Birds Unlimited.. worked in a store in Chesterfield, MO for a year! A Bluebird… very sweet. I think that would be a great Sunday activity!! Sounds like a great place- with a lot to take in … I can definitely see this being a future destination ! How wonderful that Wild Birds Unlimited has this lovely spot for birding watching. I will have to investigate and see if any of the stores here have a spot like that. I am sure Motor Mum will enjoy it. Beautiful! We love to feed and then watch. I love Wild Birds Unlimited, that’s where I buy all my seed, feeders, everything. I’ve not seen one with a bird-viewing area, though. That’s a nice touch.